In order to reduce both cost and lead time, General Digital modifies high volume LCD monitors intended for the desktop market and integrates the assembly into our final product configuration. General Digital integrates the latest advances in LCD display technology including 15" and 19" (diagonal viewing area) panels. All of our active matrix TFT LCD screens offer up to 16.7 million colors, wide viewing angles and fast response times (suitable for live video). 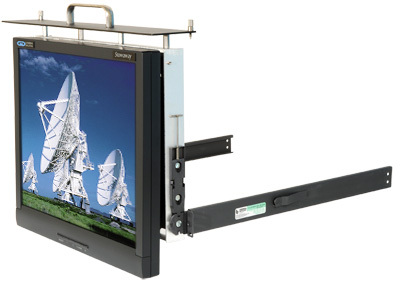 All standard Stowaway rack mount LCD monitors support non-interlaced analog video (separate sync). Features include Auto Setup, Horizontal/Vertical Positioning, Phase and Fine Tune Adjustments, Color Control, Multiple Languages, and Image Expansion (not all models). The unique design of the Stowaway flip-up/flip-down LCD monitor results in an enclosure that occupies only two vertical rack units (3.50") when stowed. 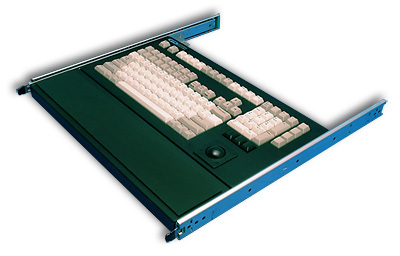 When deployed and set in operating position, the monitor extends only 4.375" to 6.375" from the rack mount chassis. This feature increases operator workspace, especially important in space-constrained environments. The slide can be factory configured for the desired extension distance. 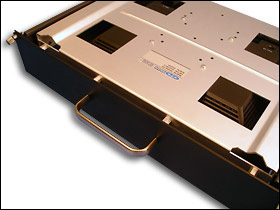 All of the interfaces (video, power) utilize locking connectors that are located on the bottom of the enclosure. A strain relief ensures that cables do not bind as the monitor is stowed or deployed. The Stowaway’s display and electronics are housed in a durable, black plastic enclosure ideal for commercial and light industrial applications. You benefit from a reduced cost of materials and lead time. The mounting bracket and bezel are constructed from lightweight aluminum, providing a durable assembly. The standard bezel is finished with a resilient black powder coat, although other colors are available on a custom basis. 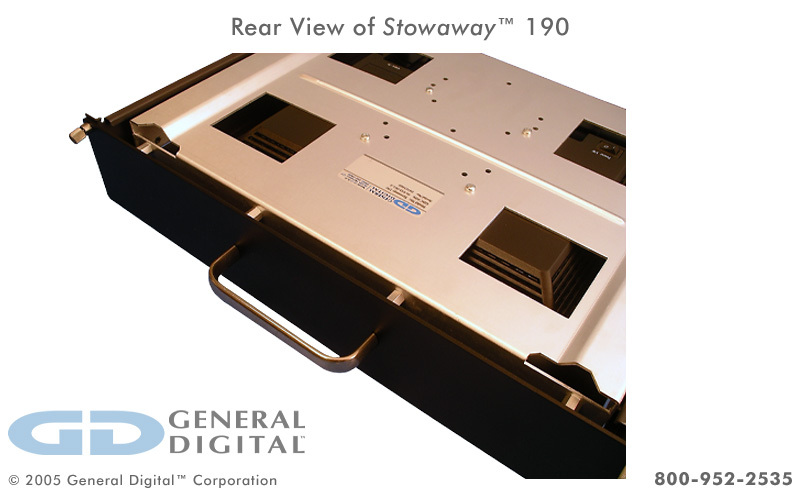 Custom designed slides allow the Stowaway to conveniently slide in and out of a 19" RETMA rack while occupying only 2U of rack space. The slides also allow the display head to pivot up 90 degrees for optimal operation. The Stowaway requires no assembly or disassembly to operate – simply slide out, pivot 90° on the robust hinges and commence operation. A glass or polycarbonate overlay can be added to the design to protect the LCD display. This feature is offered on a semi-custom basis and may affect lead time. In addition, a sealed gasket is installed between the display and bezel to protect the monitor’s electronics from dust, liquids (e.g., spilled coffee) or other debris. The low profile enclosure occupies minimal vertical rack space, and pivots 90° for operation (factory configured to flip up or flip down). This allows the device to be easily located at eye level within your 19" RETMA rack to optimize ergonomics. 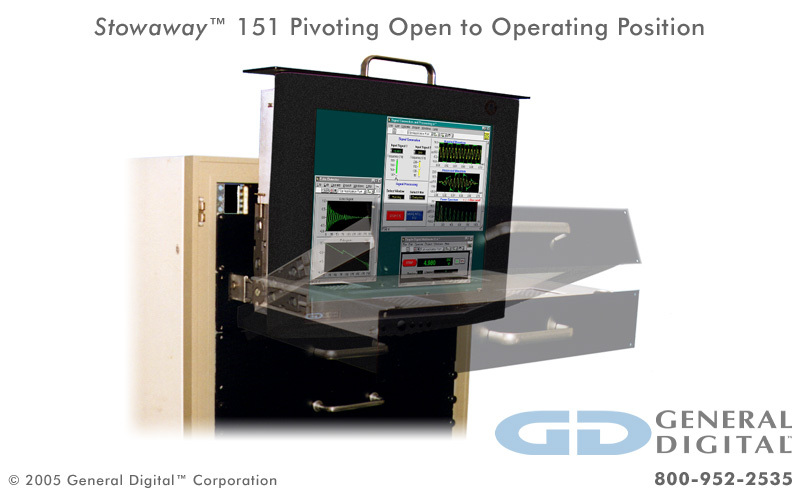 General Digital also supports a diverse product offering of commercial-, industrial- and military-grade rack mount keyboard/pointing devices (KPD) to complement the Stowaway. These KPDs can also be located within the rack to optimize ergonomics. Additionally, the KPD can be stowed out of the operator's way while the monitor is still deployed. The Stowaway has been optimized for mass production and cost efficiency. As a consequence, the design does not offer the same level of flexibility as its sister products, the Rack Mount Hinge and SlimLine Micro. However, General Digital can still offer some limited customization to the design. Please speak with a Sales Engineer for additional information. General Digital encourages relationships with Original Equipment Manufacturers (OEMs) and is willing to maintain your company identity (private label) on our products. Please speak with a Sales Engineer for additional information. In order to reduce both cost and lead time, General Digital modifies high volume LCD monitors intended for the desktop market and integrates the assembly into our final product configuration. 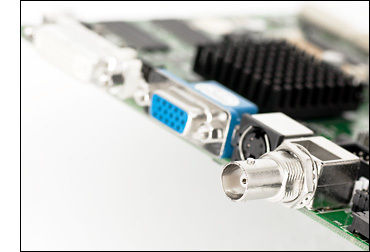 Unlike the Rack Mount Hinge and SlimLine Micro (whose components have multiple sources of supply), the Stowaway is affected by the life cycle of a single commodity product, which is typically 18–30 months. Although it is possible that the commodity monitor will be replaced with a “like or equivalent” model, it is completely subject to market availability and popularity. 500:1 16.7 Million 50,000 Hours ±80°/±70° 0°–45° 3.50" (2U) x 19.00" x 20.00"
600:1 16.7 Million 50,000 Hours ±85°/±85° 10°–40° 3.50" (2U) x 19.00" x 20.00"
1 Native Resolution is the fixed number of horizontal and vertical pixels arrayed in the viewable area of an LCD monitor. Other resolutions can be displayed. 2 Brightness and Contrast values for standard brightness displays are provided by the manufacturer of the LCD component; these values are nominal and may vary. 3 The hours for Backlight MTBF refer to the half-life of the backlight bulbs; that is, the point at which the bulbs reach half of their original brightness. It does not indicate the life expectancy of the bulbs. 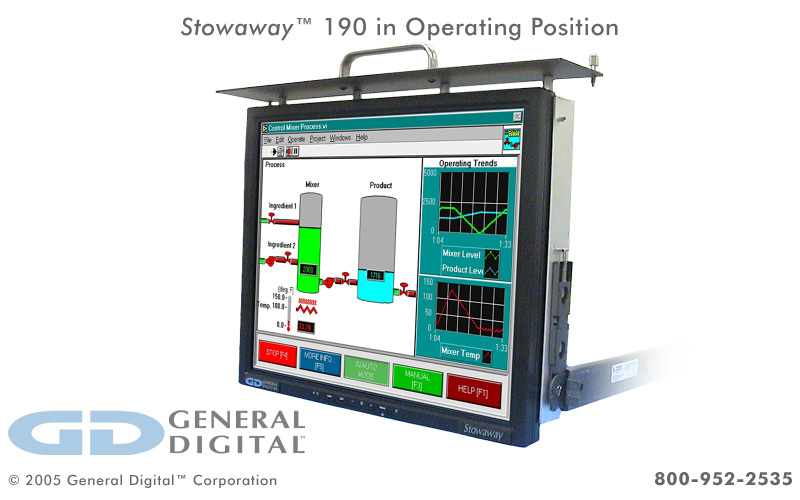 The photos below represent a small sampling of General Digital’s Stowaway LCD products. They serve to illustrate the many display sizes and mechanical configurations we offer, as well as standard and custom design features, capabilities and options. Click the thumbnails to view full-size photos. Watch the videos below to learn more about display services General Digital offers for most monitors, whether built by us or another manufacturer.